The destruction of the NKPA in the Seoul area and in the pursuit from the Pusan Perimeter made the decision to invade the North simple. MacArthur had pulled a rabbit out of his iconic flattened hat and no one would stand in the way of his insistence that such an invasion would be costless. At the time, no one would have disagreed in any event. Conditions on the ground corresponded to MacArthur’s assessment that an invasion of the North would be a walkover. Scenarios 59 through 65 cover this period. Having captured the city of Kaesong, the 1st Cavalry Division continued its advance to the north and west. The 7th Cavalry Regiment moved westward to the Yesong River and seized a small bridgehead there. Kaesong and its environs, though part of modern North Korea, were on the South Korean side of the original partition. But the North had not yet given up, and the cavalrymen faced a nighttime counter attack by a division of coast defense troops and raw conscripts. Despite a lack of heavy weapons or artillery support, the regiment’s 1st Battalion fought off repeated North Korean attacks during the night. The regiment’s 2nd Battalion soon joined the 1st, and thanks to the inspired leadership of 2nd Battalion commander Lt. Col. Gilmon A. Huff the cavalrymen held their position and resumed their advance at dawn. The 38th Parallel had not yet been crossed, but that day swiftly approached. 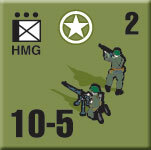 This is a tough little infantry fight; the Norks have a tiny amount of artillery support and the Americans none at all. It’s all about the bridge. Having crossed the 38th Parallel and the Yesong River, the 1st Cavalry Division’s first objective on the road to P’yongyang, the North Korean capital, was Namch’onjom. The North Koreans had lost heavily in the retreat from Pusan, including many of their weapons and their best soldiers and officers. The NKPA high command had to issue orders exhorting officers to prevent their men from throwing away their rifles. The North Koreans defending Namch’onjom received heavy bombardments from air strikes and artillery, yet seemed ready to fight. With the help of accurately-delivered air strikes, the 7th Cavalry Regiment’s 2nd Battalion captured the town against fierce North Korean resistance. The cavalry resumed its advance up the road to the North Korean capital, a march soon slowed by heavy rains as much as what remained of the NKPA. These Norks don’t know they’ve been beaten, which means that the Americans have to eject them from their positions by force. They have numbers, artillery and air power to help them in this regard; the NKPA counters with stubbornness. On the right flank of the 1st Cavalry Division, the legendary Gen. Paik Sun-yup’s 1st “Forward” Infantry Division of the ROK Army advanced without the motor vehicles of the Americans, along secondary roads and tracks instead of the main highway. Even so they made faster progress against tougher opposition, and as the cavalry fought their battle the South Koreans faced a determined enemy at the village of Miu-dong. With the help of American air power and tank support, the ROKs pressed forward against tough opposition. Paik, a former officer of the Imperial Manchukuoan Army and a devoted anti-Communist, was determined to get his troops into the North Korean capital first and overthrow the regime of Kim il-Sung. The ROKs are on the march, with sky-high morale as victory appears in sight. And they have American tanks, artillery and aircraft to help out. The Norks are outnumbered, but they do have some tanks of their own plus some anti-tank weaponry that can fend off the American armor. 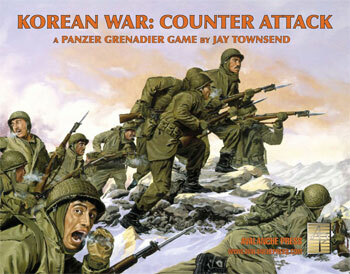 During the days of mid-October, American and South Korean generals became obsessed with a “race” to capture the North Korean capital of P’yongyang. While prestige drove most of the competition, many were also aware of the need to wrap up the destruction of the North Korean state before the bitter Korean winter set in. South of Hukkyo-ri, the North Koreans made another determined stand. The tired cavalrymen advanced against tough resistance; the North Koreans had dug in their tanks and anti-tank guns and held off the Americans despite their relatively heavy tank support (20 tanks) and repeated air strikes. The North Koreans held their ground for the entire day and then melted away under the cover of darkness. When the Americans moved forward again after dawn they found the North Korean positions abandoned. For a beaten army the Norks are pretty tough here, with adequate numbers, good support weapons and a strong position. The Americans are going to need every smidgen of artillery support they have and will have to use their aircraft judiciously (they only appear a limited number of times). Douglas MacArthur planned for American troops to enter P’yongyang first, but Paik Sun-yup had other ideas. While the 1st Cavalry Division struggled up the main highway toward the capital, the ROK division fought its way through rough terrain and cleared numerous minefields to enter the city first. The North Koreans still had a say in whether the city would be captured at all. While the U.S. Army’s Official History is very grudging about acknowledging the ROK capture of P’yongyag – the phrase “almost at the same time” appears more than once – other sources are clear that the Forward Division took the enemy capital. American tank support played a crucial role in getting the ROKs past the final North Korean defenders of the approaches to the city. This is a fun scenario with high-morale ROKs bopping their way past unenthusiastic Norks, who have good support weapons but degraded morale. It does feature something I dislike seeing in our games, “pretend X is Y” terrain rules, which should never appear in a game with six maps. Douglas MacArthur had been sent an airborne regiment from the 11th Airborne Division, and initially used them as infantry, attaching the unit to the 1st Marine Division during the capture of Seoul. Afterwards, he ordered the paratroopers pulled out of the line and readied for a jump. A month later, they floated down from the skies north of P’yongyang in a bid to cut off the North Koreans retreating from the capital. Their regimental history proclaims that the unit “conducted the two most successful combat parachute operations in history of regimental size or larger.” In reality the Rakkasans – a name earned during the occupation of Japan, derived from the Japanese word for “umbrella” – landed after the bulk of the North Korean troops and governmental officials in P’yongyang had already headed northward. Fighting soldiers from the sky drop on the Norks in an airdrop scenario. The Norks are pretty weak by this point, but, Airborne! Having failed to block the North Korean retreat, the Rakkasans collected themselves and headed south toward the North Korean capital, looking for NKPA troops to fight. Before long they found a North Korean regiment dug in and facing the wrong way; the NKPA quickly turned themselves about to face this threat from their rear flank. The North Koreans inflicted heavy losses on the airborne troops, forcing them back. But the NKPA regiment, tasked with delaying the United Nations advance, soon withdrew themselves to face British and Australian troops advancing from the south. Trapped between the Commonwealth Brigade and the Rakkasans, the 239th Regiment was eventually destroyed in heavy fighting. 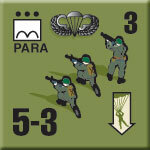 The Airborne are grounded this time, fighting as light infantry. They lack heavy weapons or artillery support, which won’t be as terrible a problem here as it could be since the Norks are in very bad shape by now – few support weapons and no artillery, though they’re still willing to fight. And that’s the final chapter. Mike Bennighof is president of Avalanche Press and holds a doctorate in history from Emory University. A Fulbright Scholar and award-winning journalist, he has published over 100 books, games and articles on historical subjects. He lives in Birmingham, Alabama with his wife, three children and his dog, Leopold. Leopold opposes the Kim regime.